Nussbaum | THE NIBBLE. Looking for something different for your Labor Day feast? 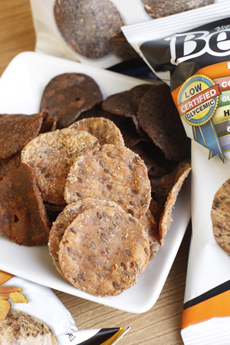 We first wrote about this flavorful bean chip—think bean dip in a chip form—some 18 months ago. They’ve become a favorite snacking chip at THE NIBBLE, so much so that they’re our Top Pick Of The Week. For Labor Day, serve them with black or refried bean dip, tomato salsa or black bean salsa. Find more of our favorite snack chips.